There something so gratifying about a before-and-after reveal. Chalk it up to immediate gratification. With that instant fulfillment mindset, it makes sense that there’s more home remodel shows now than ever before. We all love to see a home transform from lackluster to sparkling in a mere half hour. Because we’re right there with you—we’ll do you one better, here’s a before-and-after home exterior, now clad in James Hardie® siding and trim. All you have to do is scroll down. No commercials. No montages. Immediate gratification. 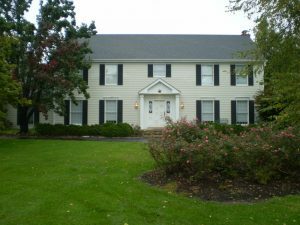 This Midwestern home was sided in creamy, off-white siding with black shutters for a usual and uninteresting look. The exterior is by no means unappealing, it just feels flat and lacking dimension. The new HardiePlank® lap siding in ColorPlus® Technology Iron Gray adds a modernity to the exterior, and the crisp Arctic White HardieTrim® boards make the gray hue pop. 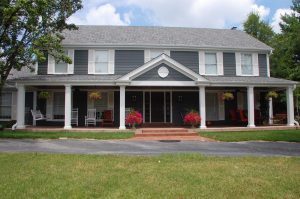 We love the crisp white trim color that matches the new columns and shutters. The updated façade is modern, fresh and inviting, not just a usual off-white flat-feeling Midwestern home. 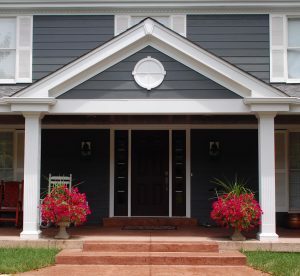 Transform your home’s exterior with a little curb-appeal perk-up from James Hardie siding and trim.